A large number of people including daily commuters spontaneously came out to the streets to register their protest at Bamakhat-Kordoiguri PWD road at Bajali in Assam’s Barpeta district demanding immediate repairing of deplorable condition of road. 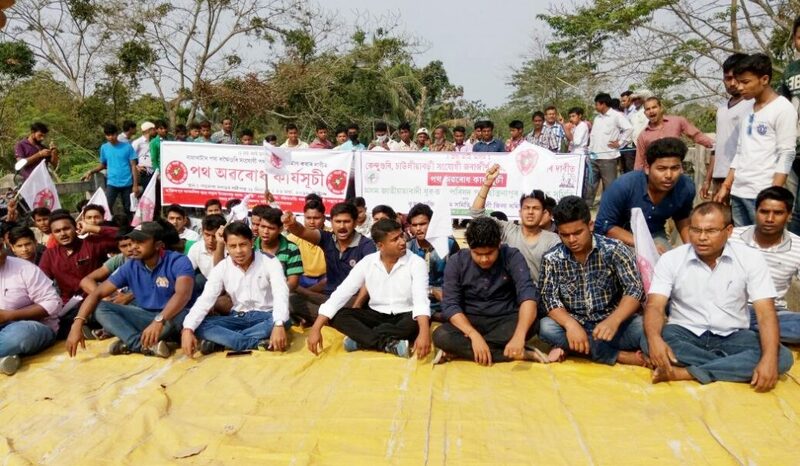 The protest was organized by Hastinapur anchalik committee of All Assam Students Union (AASU), Asom Jatiyatabadi Yuva Chatra Praishad (AJYCP) and Krishak Mukti Sangram Samiti (KMSS). The protestors blocked traffic movement along the road and registered their protest. The said road is one of the important roads of Bajali sub-division which connect large number of revenue villages with the headquarter town of Bajali sub-division, Pathsala. The road also connects both Patacharkuchi LAC and Bhabanipur LAC as one portion falls in Bhabanipur LAC and another portion falls under the Patacharkuchi LAC. The protestors alleged that the local legislators have failed to do the needful and hence the people having no alternative are compelled to use the deplorable road. The road eroded badly and developed potholes besides worse erosion in the bridges approaches. Locals also alleged that the road has presently turned into a death trap for the people of the area as accidents take place almost regularly. Commuters including school students and office goers have to face hardship daily because of the road. The road which was constructed several years ago began to erode even after few years of construction and due to lack of proper maintenance in the road. The road connects National Highway 127 at Kenduguri and is one of the busy roads in the locality. Rush of vehicles and commuters make the road busy from dawn to midnight.